Another little device that I made earlier this year is a USB interface board for a Noritake -3900 series graphical VFD display. 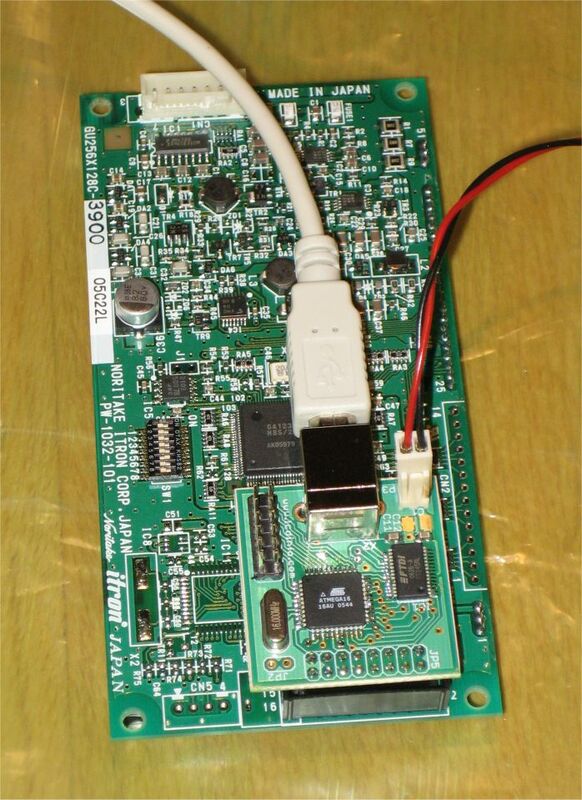 Here we have the interface connected to a GU256x128C-3900 display. This interface is useful for easy communication and fast update speeds allowing for example animation when using these displays with a PC. These are also available for sale if someone needs one. The USB interface boards have been used with the 256×128 and 256×64 sizes for now but other resolutions from the 3900 series are also possible if needed. This entry was posted on Tuesday, May 8th, 2007 at 13:32	and is filed under Uncategorized. You can follow any responses to this entry through the RSS 2.0 feed. You can leave a response, or trackback from your own site.